Unfortunately, this book does not live up to its title.It is just a collection of lectures dealing largely with the history of science leading up to Quantum Mechanics. Each of the lectures very lightly touches on philosophical implications without actually discussing them. There are many profoundly interesting implications of Quantum Mechanics to ontology, epistomoloty, etc.None of these are mentioned at all. Find another book if you want one that actually covers the subject implied by the title. There are many books on quantum physics and the men who discovered it.The best I have read were by Brian Greene.While this book was not a difficult read, I didn't find it of any particular interest.This, in spite of the fact that I am deeply inspired by what quantum mechanics may say about our existance. Werner Heisenberg was respected for his intriguing lectures on the philosophical implications of the new physics, what is now known as quantum physics. He avidly shared his fascination with man's changing concept of reality, and the contribution of quantum physics to a more fundamental understanding of reality. And yet, he took pains to explain that quantum physics was only one explanation of reality. He concludes one lecture with a remarkable statement: Revere those things beyond science which really matter and about which it is so difficult to speak. Heisenberg's lectures span the period in German history, 1932 - 1948, that witnessed the growth of Nazism, the dictatorship of Adolph Hitler, the devastating war in Europe, the systematic genocide of the European Jews, the total military defeat of Germany, and the division of Germany. Nonetheless, these philosophical investigations make no references to the staggering political and military events in Europe. They seem to have been presented in a vacuum. The final lecture, a commencement speech at Gottingen University in July, 1946, was an exception. Heisenberg now questions the proper role of scientists in the modern world, their conflicting role as a contributing member of the international community of scientists versus their role in the service of their own country. He talks of the "frightening aspect of our present-day existence", not just the atomic bomb, but the potential for "chemical means of destroying life", the "practical possibility to produce infectious diseases artificially", and "perhaps worse, even the biological development of man may be influenced in the direction of some predetermined selective breeding". Heisenberg likes to begin his discussions of quantum theory by tracing man's efforts to define reality, beginning with classical Greek philosophy. He argues that reality as defined by quantum theory today is actually closer to early Greek concepts than was the deterministic, objective reality that was the foundation of Newtonian physics. Despite the passage of several decades and major advances in physics, these lectures are still thought provoking and stimulating. Heisenberg himself will long be remembered for his contributions to quantum physics. I suspect that his lectures on the philosophical problems underlying modern physics will not be forgotten either. Was Heisenberg a great physicist? CERTAINLY! I have always thought of physics as the most marvelous branch of science.It is the field which has granted us Laplace's demon, Pauli's exclusion, Heisenberg's uncertainty, Schroedinger's cat, Wigner's friend, theCopenhagen interpretation and Everett's quantum universes (among otherconceptions).At the center of it all, where the boundaries of physics andphilosophy overlap, we find the great Werner Heisenberg directing traffic. In many ways, Heisenberg's uncertainty principle (1926) was the snowballthat got the discipline of quantum mechanics rolling. Years later,Richard P. Feynman was quoted as saying that every new discovery intheoretical physics since H's uncertainty principle was merely a re-statingof the uncertainty principle. This book deals with many of thephilosophical problems associated with QM such as how observation effects"reality" (if there is such a thing) and the disturbing wave /particle duality which is exhibited by matter.In short, QM has changedalmost everything insofar as how we interpret the "actual" world. We are forced to revise what used to be common sense notions such as areality that is independent of an observer.And, as H writes on page 18,there is no turning back: "The hope that new experiments will yet leadus back to objective events in time and space, or to absolute time, areabout as well founded as the hope of discovering the end of the worldsomewhere in the unexplored regions of the Antartic." And so, thebest we can do is to try to cope with the myriad unsettling (if not absurd)implications of quantum mechanics.Heisenberg entertains many and variedthoughts on this subject & delivers them in a lucid fashion. The bookalso discusses some of the concepts of classical physics, some of whichstill hold & some which do not.H goes into detail regarding thetheories of light & colour which were devised by such great minds ofthe past as Newton and Goethe. The last chapter in the book deals withthe hope that science can be used as a medium by which diverse cultures maylearn to understand each other.After all, even though the politicalparadigms and ideas of nation A differ from those of nation B, 1+1 still =2 in both places.Scientific truths can transcend national prejudices andsuspicions.That, among other things, is one of its endearing traits. I really enjoyed reading this book.It delightfully combines the biography of Heisenberg with the early developments in quantum physics.So many of these great physicists were friends and their constant communications and sharings with one another were extremely interesting and gave me a feeling of intimacy with them.They stimulated one another to new creative ideas;that is surely the way most innovative ideas are created.It gives one hope for the continual communication being carried on through today's technology. I am looking for a book from Heisenberg, called " particle and total" or something like that. however, I suspect this book is the same one. is anyone out there to know about this? Physics and Beyond contains Heisenberg's most sophisticated statements of his philosophy of quantum theory, and is also a watershed inspiration for the contemporary pragmatist philosophy of science that prevails in academia today. The mutually contrary philosophies of Einstein and Bohr produced Heisenberg's two inconsistent philosophies of quantum theory.Bohr's influence resulted in Heisenberg's doctrine of closed-off theories in his "Notion of a 'Closed Theory' in Modern Science" in Heisenberg's book titled Across the Frontiers. The alternative, which is the contemporary pragmatist philosophy of science, is due to a conversation with Einstein as related in Heisenberg's "Quantum Mechanics and a Talk with Einstein (1925--1926)", the fifth chapter of this book.In this conversation Einstein told Heisenberg that it is the theory that decides what the physicist can observe.This view of the semantics of observation contradicts not only the views of Bohr and the positivists but also Heisenberg's own doctrine of closed-off theories. In the next chapter, "Fresh Fields (1926-1927)", Heisenberg described his implementation of Einstein's advice: Firstly he reconsidered the idea that what is observed in the cloud chamber is a trajectory, such that the theory that was deciding what is being observed is the Newtonian theory. Secondly using Einstein's thesis that the theory decides what can be observed, Heisenberg concluded that the processes involved in any experimental observation in microphysics must satisfy the laws of quantum theory. He then derived the mathematics of the uncertainty principle, in which the observations are governed by a limit that is a function of Plank's constant. Heisenberg's re-interpretation is not only semantical but also ontological.He described as the "decisive" step in the development of special relativity, Einstein's rejection of Lorentz's distinction between "apparent time" and "actual time" in the interpretation of the Lorentz transformation equation, and Einstein's taking "apparent time" to be physically real time, while rejecting the Newtonian concept of absolute time as real time. This is a realistic interpretation of relativity theory, and Heisenberg applied it to his quantum theory.Therefore instead of asking himself how he could express in the Newtonian mathematical scheme a given experimental situation, notably the Wilson cloud chamber experiment, Heisenberg asked whether only such experimental situations can arise in nature as can be described in the formalism of his matrix mechanics.The new question is a question about what can arise or exist in reality. Today academic pragmatist philosophers of science call this interpretative practice "scientific realism." For more on Heisenberg Google my book titled History of Twentieth-Century Philosophy of Science and select BOOK IV at my web site philsci with free downloads. Incredible Book. Mind in Motion of a Great Scientist. Werner Heisenberg is the one great, if not provocative figures of the 20th. century Science.Famous for his Uncertainty Principle and formulation of Quantum Mechanics. Unfortunately, the two great great theories of the 20th. century science, quantum theory and relavity theory was formulated in Central Europe during the two World Wars. Heisenberg, born in 1901 was a witness to the World War I, World II and the Cold War. Heisenberg reflects this in detail.How does one deal with political chaos and diaster during the Hitler reign in Germany. He himself decided to stay in Germany.Bohr, Fermi, Einstein all fled Europe, he decided to stay. Enrico Fermi tells in 1939 "America is a bigger and freer country.Leave the ballast of the past, pettiness of the Old World, One can start anew in the New World." History will forever debate the Heisenberg of World War II. Part history, part science, but the most interesting is his encounters with the great scientist of the 20th century. Science you can learn from any textbook. Moreover, his emphasis on experiment, experiment data, experimental observation as basis for all science is important here. Written in "conversation" form, we meet and hear the great scientist of the 20th century.Sommerfeld was his teacher, Wolfgang Pauli his classmate.He fellow scientist Born, Neils Bohr, Enrico Fermi, Paul Dirac, Einstein and many other greats are here. This book makes them all human because they had to struggle to come "discover" science and the political diaster that engulfed Europe in the first half of 20th. century.Edward Teller "Mr. H-Bomb" was student of Heisenberg.All has to grapple with politics and history. This book should be back in Print.Book is the mind in motion of a great scientist.With discovery of atomic theory, the linking of science and politics is joined forever.Science can never just be science and politics just be politics. Unfornate but true. Knowledge renders power.No one is more "powerful" than scientist now and in the future. Once you know the "laws of nature", you then can be "master of nature". 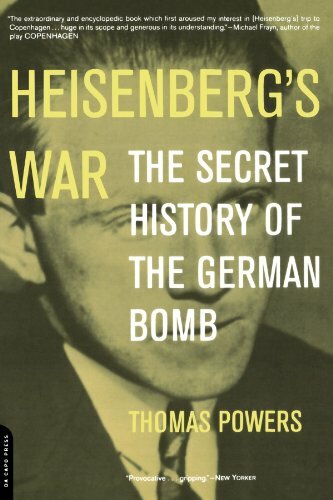 This is an absolutely fascinating book when read between thelines.Werner Heisenberg (best known for his uncertainty principle,but also remembered as one of the few truly great scientists who nevertheless swore allegiance to the Nazis) explains, in his own words, why his leadership of the German atom bomb project in WWII was morally defensible. 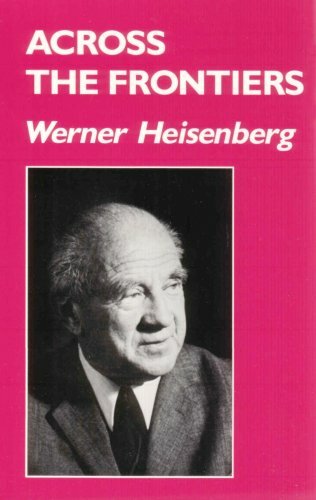 Heisenberg was, in his moment of glory, in the unique position of being the intellectual better of both Niels Bohr and Albert Einstein.He explains this at some length in his book, which consists of stilted, imaginary conversations he had or "would have had" with other scientists.According to Werner, he used his powerful intellect to deliberately mislead the Nazis and to thwart the German atom bomb project.If you believe this, you will also believe that he did it in order to "save German youth." It's a complex work in which Werner comes off as less than courageous. If you've ever felt intimidated by Heisenberg (and who wouldn't be?) you will appreciate Lindemann (the legendary mathematician) dismissing him as worthless.Also worth reading are Heisenberg's hopelessly antiquated views on biology, language, music and philosophy . .. you will feel better, because you know more than he ever did, even though he formalized quantum mechanics. This book is a good introduction to modern physics.It shows both the reasoning and the cultural context that led to this still-rather-dubious abstraction.Quantum mechanics is more comprehensible when you understand the characters who invented it. The seminal work by one of the most important thinkers of the twentieth century, Physics and Philosophy is Werner Heisenberg's concise and accessible narrative of the revolution in modern physics, in which he played a towering role. The outgrowth of a celebrated lecture series, this book remains as relevant, provocative, and fascinating as when it was first published in 1958. A brilliant scientist whose ideas altered our perception of the universe, Heisenberg is considered the father of quantum physics; he is most famous for the Uncertainty Principle, which states that quantum particles do not occupy a fixed, measurable position. His contributions remain a cornerstone of contemporary physics theory and application. I see people usually like this book. It is remarkable how much history of philosophy Heisenberg knows, however I don't really find a thesis here. Not like the principle of complementarity of Bohr. He makes parallels and shows how August Conte was wrong in the way that he didn't proclaim that science evolved of changes in language. I does not go far from the standards from today. 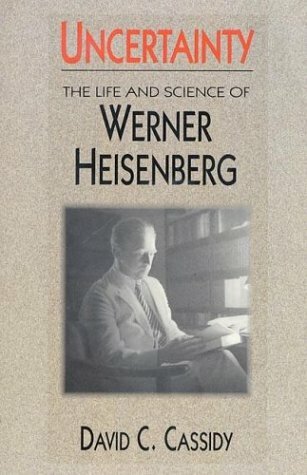 Werner Heisenberg's classic text on physics and philosophy is a must read for all those in quantum theory today who feel as one of the founders of the Standard Model of Particle Physics; in"Dreams of a Final Theory," Dr. Stephen Weinberg, in some ways very hostile, if that is not too strong a word, towards philosophy (because Dr. Weinberg asserts that philosophy has only obtruded or obscured the quest for the final laws of nature: in surveying the philosophy of science literature today, one gets the bewildering feeling that the only thing that matters is taking an obscure subject matter and turning it into an incomprehensible one.) concedes that "we need to better understand quantum mechanics." If this is true, and if philosophers of science can assist in the scientific quest (a premise Dr. Weinberg disagrees with, I think) by purifying the reasoning or methodology of the scientific quest, then philosophy of science can be a gaurdian of what W. V. O Quine considered the "queen" of the sciences--i.e., physics. Certain philosophers of physics assure me that this task will be necessary until a final theory is in hand, if ever, after long millenia, it can be in hand. The work of William Lane Craig and Quinton Smith is an excellant example of what philosophy can do for science, the work of Albert William Levi "Philosophy and the Modern World" is a masterful study by a non-scientist of the work of, for example, Albert Einstein and Max Planck and of Alfred North Whitehead. Modern philosophy itself--in its Logical Positivist manifestation--is technological;consider alone the level of attention paid to relativity theory and quantum mechanics by the Vienna Circle. The German physician and philosopher Heisenberg counts together with the German Erwin Schrödinger as founder of the Quantum mechanics. 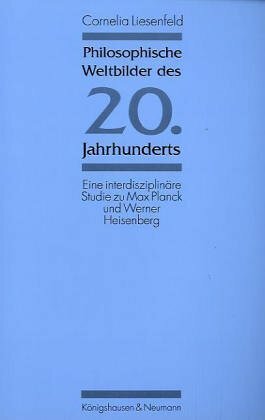 In the year 1927 he formulated the uncertainty relation, German: "Unschärferelation" (also called indeterminacy principle) according to which place and impulse of a subatomic particle cannot be destined at the same time. For his quantum physical research he received in 1932 the Nobel prize of physics. After the second World War Heisenberg became director of the Max-Planck-Institute. His "Einheitliche Theorie der Elementarteilchen" (unitary theory of elementary particles) from the year 1958 was called "world formula" (although that is just what it is not!) and strengthened Heisenbergs position as one of the most important representative of quantum physics. In countless lectures and essays he disputed the philosophical implications of quantum physics, among others in "Quantentheorie und Philosophie", "Physik und Philosophie" and "Der Teil und das Ganze". "The quantum theory leaves no room for a totally objective description of nature... In the experiments of atomic procedures we have to do with material things and facts, with phenomenons so much real as any phenomenon in daily life. But the atoms or the elementary particles are not equally real. They form much more a world of tendencies and possibilities than a world of things and facts." Quite a heap of idealism, it seems, but a compelling conclusion from the datum of physics? Does a spiritual principle stick behind the whole cake? The universe as quantum world! A world which is incessantly in movement because she is designed like that. Only by movement is the personality-structure of all proprieties held. Still-stand is death, or better: non-existence. Is there still-stand at all? Nowhere is it visible, nowhere it has space. Einstein struggled long against the quantum theory. He tried to adopt it to the theoretical fundament of the classic physics and confessed to himself that he failed. There is no solid - you could also say no material - ground on which the order of the world is built! Many years Einstein spent to give the world the knowledge, that there is no chance to pass by the quantum theory, an almost metaphysical theory, when describing reality. In reference to Einstein`s theory of relativity Heisenberg had called the fact that all physical systems possess either the propriety of a wave or of a particle and that only one of the two is measurable, "indeterminacy principle" or "uncertainty relation". Material, according to Einstein nothing but of time and energy, was robbed of it`s last consistency. Und such thing should have stood in the beginning of the universe? Impossible since the quantum mechanics stand before. Material needs an idea to start movement. A frontier crossing to the spiritual realm is inevitable! Interestingly Heisenberg perceived the contradiction of the quantum theory to modern biology. "...most biologists are prepared to confess, that the existence of atoms and molecules can only be understood with the help of the quantum theory, but besides that they have the wish to regard the working material of the chemists and biologists, namely atoms and molecules, as stuff of classic physics, thus dealing with them as with stones or grain of sand." Creation is, by all appearance, provided that we are ready to believe the quantum physics an artfully, a subtle construction, a "Within" which does not only make an "Outside" thinkable but even demands for it. Any attempt of a world formula" in the sense of Einstein must therefore fail, because it wants to explain the Within without the Outside! Some may flinch from the title of the book or the name of the author to read the book. The fears are not grounded. Basic knowledge of atomic physics is sufficient to understand what the author is talking about. He uses a clear and simple diction. If one understands his theories is another matter. But this might be indebted to the ideology one tends to hold. Physical theories had to be proposed speculatively and pursued deductively with respect to their many consequences that can be put to theoretical and experimental verifications. It turns out that the theory makes more physical and philosophical assumptions than the facts alone imply. The assumptions could be ontological or epistemological in nature. For example, the concept of space and time (and its relation to matter) is independent of the observer, which would be ontological in nature since the subject matter of scientific knowledge is independent of the perceiver (consequences of relativity). The nature of quantum physics introduces indeterminacy to nature of things which would be epistemological since the experiment performer (and knowledge-seeker) influences the subject matter (the outcome his experiments) by his physical observation. The state of a quantum object is undetermined until an observation is recorded. Hence, the author's argument is that the potentiality is a part of physical reality. Einstein's contention was that the potentiality, probability or chance is due to epistemological limitations of our knowledge in knowing the entire picture, the Omni-complete, and hence misapplied to the object itself. The Omni-complete object is omniferous, omnifarious, omniparous, omnipotent and omniscient and therefore the concept of chance or probability is inappropriate in the description of a real object. Both Einstein and Heisenberg admitted that the experimental data does not lead to concepts of physics, and hence the object of scientific knowledge remains unknown, but it is known through the theoretical constructs or axiomatic postulation verified indirectly by experiments and its deduced consequences. To find the object of scientific knowledge one must go to the theoretical assumptions of a physical law; the concept of probability and chance figures into the definition of the state of a physical system (due to statistical nature of things, and also use of statistical analysis in understanding the results of an experiment) in both classical and quantum physics. In quantum physics it also figures in the subject matter, but not in classical physics. This is the major difference between two disciplines that separated Einstein from Copenhagen school of thought. Author Heisenberg suggests that the concept of potentiality very much a part of subjective reality contrary to classical reality. The probability function represents a mixture of two things, partly a fact and partly our knowledge of a fact. An atom consists of a nucleus and electrons (wave) moving around the nucleus; from the classical standpoint it is difficult to conceive how an electron orbit around the nucleus without changing its energy. Then again the electron is a wave until detected; therefore the energy is constant as long as it stays in the same orbit. The second point is that the act of determining the position becomes a measurement problem since light quanta is absorbed during its detection and the electron is displaced (change its position) to a higher electronic state. Thus the spacetime descrip¬tion of the atomic events is complementary to their deterministic description. The probability function obeys equations of motion as in Newtonian mechanics; its change in the course of time is completely determined by the quantum mechanical equation, but it does not allow a descrip¬tion in space and time. The observation, on the other hand, enforces the description in space and time but breaks the determined continuity of the probability function by changing our knowledge of the system. The mechanism and the results of an observation of atomic events can be described in classical concepts, but the deductions from observations results in probability functions which combines the statements about possibilities with statements about our knowledge of facts. Therefore we can not completely objectify the results of an observation. What happens between an observation and the next depends on the way we observe or on the fact we observe. This becomes subjectivism. Since the probability function combines objective and subjective elements. It contains statements about possibilities or better tendencies ("potentia" in Aristotelian philosophy), and these statements are completely objective, they do not depend on any observer, but it contains statements about our knowledge of the system, which of course are subjective in so far as they may be different for different observers. In ideal cases the subjective element in the probability function may be practically negligible as com¬pared with the objective one. 5. What Is Life? : with "Mind and Matter" and "Autobiographical Sketches"
Quantum science is without any doubt the greatest breakthrough of science in the 20th century.If you want to know what quantum physics is all about, read this fluently written introduction to quantum physics by one of the founders of the theory himself, Nobel Prize winner Dr. Werner Heisenberg.It is very uncommon that a great scientist is capable to transmit his profound knowledge in such an easy to read book, without a single formula. (For the ones interested in the mathematics behind this theory, he has also written another book : "The physical principles of the quantum theory").In the world of today, Aristotle's deeper understanding that philosophy is the mother of science has been forgotten, something that Heisenberg not only recalls, but actively uses as a guiding principle throughout this book. Quantum physics is important, since it produced a revolution within the materialistic perspective of classical physics.At elementary level, there is no longer a sharp distinction between matter and energy.Heisenberg says : "The elementary particles are certainly not eternal and indestructible units of matter, they can actually be transformed into each other. As a matter of fact, if two such particles, moving through space with a very high kinetic energy, collide, then many new elementary particles may be created from the available energy and the old particles may have disappeared in the collision. Such events have been frequently observed and offer the best proof that all particles are made of the same substance : energy." This way he also solves the duality between particles and fields.If energy is the primary substance of the universe, then it will only depend on the experiment how we will observe this energy. "What we observe is not nature in itself but nature exposed to our method of questioning." Werner Heisenberg's genius and his place at the forefront of modern physics are unquestioned. His decision to remain in Germany throughout the Third Reich and his role in Hitler's atomic bomb project are still topics of heated debate. UNCERTAINTY is David Cassidy's compelling portrait of this brilliant, ambitious, and controversial scientist. It is the definitive Heisenberg biography, as well as a striking evocation of the development of quantum physics, the rise of Nazism, and the dawn of the atomic age. As the reviews in at the backcover stated, the writer deals thoroughly and fairly with the controversies surrounding this great scientist. This book gives a good overview of the man himself, his science, and the times he lived through. It is one of those works of enormous scope, that will probably not be topped. Just like the Making of the Atomic bomb or other alike tour the force works, it makes me wonder how many letters, sources, and interviews must have been worked through to make the picture come alive. This is the definitive work on Heisenberg, and it gives also the best explanation of how the quantum Copenhagen interpretation as well as the uncertainty principle work! So it is recommended for historians, for scientists, or people who have an interest in both. Very highly recommended! "Uncertainty" is an outstanding piece of biographical and history of science writing.The only shortcomings of the book, in my view, are: 1) the short shrift it gives to WH's life and career post-WWII; and 2) its sometimes overly abstruse exposition of WH's science.Concerning this last point, Cassidy is clearly writing for an expert (or at least highly sophisticated lay) audience.Though I got the gist of much of the specialist detail in "Uncertainty", I would have appreciated and greatly profited from some more general discussion along the way.That said, Cassidy paints the science in sufficiently broad strokes that even the non-specialist can grasp (with some effort!) something of the beauty and complexity of quantum physics.I have always been fascinated with quantum physics.Having just finished "Uncertainty" I am all the more intent on brushing up my math and doing some serious study of the discipline.Books like "Uncertainty" inspire the quest for knowledge.Cassidy is to be commended. This book is not for the lighthearted.It is an excellent account of the life of Werner Heisenberg and of the strong nationalism that blinsided him to the situation in Nazi Germany. His brilliance as a first rate physicist notwithstanding, the book shows by example what happens to science when it becomes totally subservient to a totalitarian regime and shows the problems of regional politics overtaken by a ruthless dictator in the funding of science.The fine line that Heisenberg walked did not diminished his scientific accomplishment but did not excuse him from his participation in a scientific enterprise that could very well have changed the course of history had it been successful, a Nazi A-bomb.The book is also a lesson on the results of elitism in science and it shows how the Nazis cheated themselves from an even greater role in nuclear physics because of their policies. If you are an EE, physicist or scientist then definitely you will like it. Or if you just like to read stuff to stimulate your mind to think about deep thoughts then you will like it too. This is one of those books that you go over things slowly and if you are lucky then eventually you will run across stuff like "Ahhh !!!... I didn't think that way !!!!". On the other hand, stuff written by the one an only Heisnenberg, how cool is that !!!!. Anyways, this book is a miscelaneous collection on several different topics, not a biography. Beyond his scientific concepts, Heisenberg the philosopher is also a man of spiritual and moral insight ... "It is only within this spiritual pattern, of the ethos prevailing in the community, that man acquires the points of view whereby he can also shape his own conduct wherein it involves more than a mere reaction to external situations; it is here that the question about values is first decided. Not only ethics, however, but the whole cultural life of the community is governed by this spiritual pattern. Only within its sphere does the close connection first become visible between the good, the beautiful and the true, and here only does it become possible to speak of life having meaning for the individual." This book is highly recommended for scientists, visionaries and philosophers. This book contains a most moving description of scientific discovery!!! I do not understand why the person from Cardiff only gave it 3 stars. Even the most distinguished physicists of all time have commented upon a page in this book which falls in the same vein as people like Beethoven being satisfied with the 9th at its end. Consider these lines "I concentrated on demonstrating that the conservation law held, and one evening I reached the point where I was ready to determine the individual terms in the energy table, or, as we put it today, in the energy matrix, by what would now be considered an extremely clumsy series of calculations. When the first terms seemed to accord with the energy principle, I became rather excited, and I began to make countless arithmetical errors. As a result, it was almost three o'clock in the morning before the final result of my computations lay before me. The energy principle held for all the terms, and I could no longer doubt the mathematical consistency and coherence of the kind of quantum mechanics to which my calculations pointed. At first, I was deeply alarmed. I had the feeling that, through the surface of atomic phenomena, I was looking at a strangely beautiful interior, and felt almost giddy at the thought that I now had to probe this wealth of mathematical structures nature had so generously spread out before me. I was far too excited to sleep, and so, as a new day dawned, I made for the southern tip of the island, where I had been longing to climb a rock jutting out into the sea. I now did so without too much trouble, and waited for the sun to rise". These lines rank among the most vivid in the description of scientific discovery. It is strikingly beautiful and the man is pretty much telling us how he gave birth to MATRIX MECHANICS AND THE UNCERTAINITY PRINCIPLE. Beauty in exposition warrants 5 stars, not a suffocating 3! All in all a very satisfying book. A lot of the interesting bits are covered in the appendix, but I found it too dense to attempt to read (an attempt to cram too much into a short book). After learning the subject from other sources this would probably be interesting to revisit to get a historical perspective, but I don't rate it high for learning from. The only thing mysterious here is how this great scientist has managed to muddle up his own theory in this book to the point where its unintelligible.It takes him a chapter to state that the electron does not have a velocity or a path in the classical sense.And why give this book such a blatant appealing title to lure beginners to pay money for this trash.No examples or end-of-chapter problems either.Read Lev Landau instead. I was pleasantly surprised by this book. It uses technical language (which can at times can become difficult), to express the physical context surrounding the development of Quantum mechanics, and deal with the matter at hand (pardon the pun). Quantum theory has a reputation as being difficult, confronting and unbelievable. 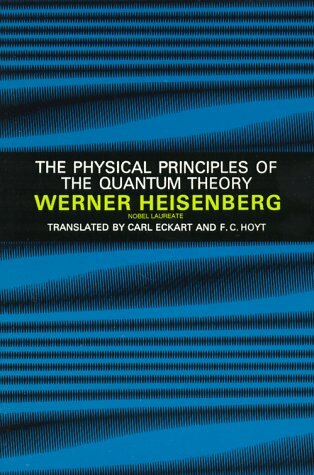 However this book expresses logically and in detail, the physical principles of the Quantum theory, by the great Werner Heisenberg himself. Not really for beginners in spite of appearances, this book sketches Heisenberg's path in discovering the canonical commutation rules of quantum mechanics. After trying unsuccessfully for years to quantize the helium atom via the Bohr-Sommerfeld quantization rules (which attempt Einstein had already explained in 1917 to be hopeless, because the classical 3-body problem is nonintegrable), Heisenberg was finally motivated by the example of relativity (where absolute time had to be abandoned) to give up the assumption that the position and momentum of a point particle are simultaneously predictable. To follow Heisenberg's reasoning the reader must first understand action-angle variables in classical mechanics. With Einstein's 1917 paper in hindsight, the three body problem representing the helium atom energy spectrum was finally approximated semi-clasically around 1990 based on a path-integral approximation to a chaotic Hamiltonian system. This book is a collection of nine essays/lectures delivered by Werner Heisenberg in the last few years of his illustrious career in the contribution to the understanding of physical reality. This group of essays deals, briefly, with the historical development of quantum mechanics, and how the concept of matter as a particle was replaced by energy and by fundamental symmetry. These essays not only touch of upon one of the most fundamental aspects of physical reality but also some of the most private moments in the lives of the founding fathers of modern physics. The title of the book "Encounters with Einstein" is somewhat misleading since only one essay (chapter 7) deals with this subject and this chapter has the same title as the book. Heisenberg was a student of Sommerfeld at Munich who was a close friend of Einstein and a supporter of theory of relativity who use to share Einstein's letters with his students, and discuss the physics written in these letters. Heisenberg describes his interest in meeting Einstein as he started working in the developing field of quantum physics. This was during 1920s when quantum mechanics was beginning to take shape. It was also the time when the Third Reich was gaining momentum and anti-Semitism was soaring in Germany. Einstein was most respected in the academic world and obviously he was the target of nationalists. At the 1922 congress of German scientists held at the Leipzig, the students of one of the most respected association of German Experimental Physicists distributed red leaflets suggesting "that the theory of relativity is totally unproved Jewish speculation, and that it had been undeservedly played up through the puffery of Jewish newspapers on behalf of Einstein, a fellow member of the race." Heisenberg recalls this as the poisoning of science by political passions. It is ironic if we recall that Islamic countries and Islamists brand 9/11 terrorist attack to Jews and Israel: This is certainly very saddening. According to one of the Einstein's work; the requirement that a physical theory should only contain quantities that can be directly observed will guarantee a connection between the mathematical formalism and the phenomena. In one of his discussion with Einstein, Heisenberg argued that the path of the electron within an atom must be abandoned from the theory because no such path is experimentally observed except for the light frequencies radiated by the atom, intensities and transition probabilities. Heisenberg stated that he was astonished to see that Einstein did not agree with him and in fact argued that the theory in fact also contains unobservable quantities. When Heisenberg pointed out that Einstein had made a similar assumption (existence of only observable quantities) in the special theory of relativity, he responded simply by stating; "Perhaps I did use such philosophy earlier, and also wrote it, but it is nonsense all the same." Einstein had revised his philosophical outlook. His vision was that the concept of observation was problematic because it presupposes that there is an unambiguous connection between the observed phenomenon and the sensation that enters consciousness. We can be sure of this connection if we know the natural laws by which it is determined. These laws do not include consciousness in equations. This interaction between the two great physicists illustrates the confusion that existed in making sense out of quantum reality, and Heisenberg recalls that this conversation had deep impact on his development of uncertainty principle. Another point of discussion Heisenberg recalls is that statistical nature of quantum reality arises because of our incomplete knowledge of a system. Einstein was steadfast in his conviction that it is not statistical even though in 1918 he introduced such statistical concepts. There is an interesting routine interaction with Einstein and Bohr during the well known 1927 Solvay conference, and how he use to come up with his little thought experiment and beaten by Bohr. The Einstein's watchword was "God does not play at dice" and the response by Bohr (less-known in literature) was; "But still, it cannot be for us to tell God, how he is to run the world." Heisenberg concludes that physics is a reflection on the divine ideas of creation, therefore physics is divine service. 4. What Is Life? : with "Mind and Matter" and "Autobiographical Sketches"
These essays were first published by Seabury Press in 1983 under the title Tradition in Science. 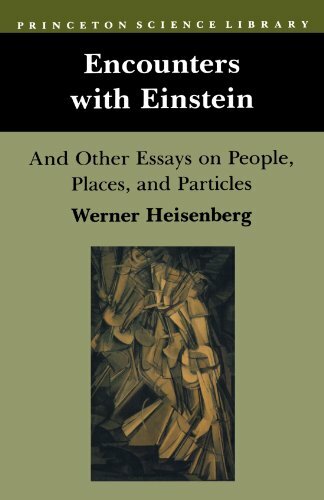 A new edition, titled Encounters with Einstein And Other Essays on People, Places, and Particles, was published in 1989 by Princeton University Press. Throughout his life Werner Heisenberg shared his enthusiasm for physics and philosophy, frequently giving presentations to general audiences. Several essays address the history of quantum physics. Others are more technical and include topics like cosmic radiation, particle physics, and closed-theories in physics. All essays are well-crafted and should be accessible to a wide audience. Heisenberg only met Einstein on a few occasions. The title essay, Encounters with Einstein, describes these encounters, including a final meeting at Princeton a few months before Einstein's death. While he admitted that he had never discussed politics with Einstein, Heisenberg did comment on Einstein's pacifism. Heisenberg does not discuss his own beliefs, nor his role in WWII Germany. 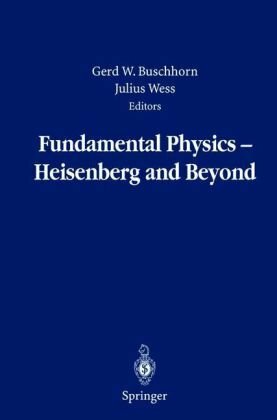 At several points in this collection Heisenberg expresses his concerns with the theoretical direction that particle physics was taking in the early 1970s. In his essay "What is an Elementary Particle? ", he expresses his doubts regarding quark theory. It was interesting to see Heisenberg in one essay lamenting Einstein's reluctance to accept quantum theory while elsewhere he himself was having difficulty with quark theory. I highly recommend these essays for any reader wishing to become more acquainted with Heisenberg. 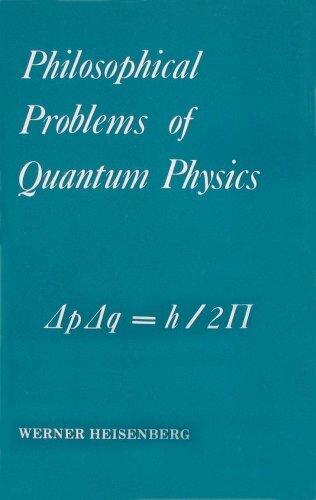 Also, as a follow-up I suggest reading Philosophical Problems of Quantum Physics, a collection of Heisenberg's lectures that span 1932-1948. The more persistent reader might be interested in Physics and Philosophy: The Revolution in Modern Science.This work by Heisenberg is more philosophical and requires careful reading. This volume benefits from a lengthy and scholarly overview by F. S. C. Northrop, Sterling Professor of Philosophy and Law, Yale University. This book reminds me a great deal of, "A Mathematician's Apology" by Hardy. Like Hardy, Heisenberg is in his last years, and knows that his productive ones are behind him. Therefore, he puts forward a series of essays and lectures that are a retrospective of his activity in physics as well as some philosophical thoughts concerning where he believes it is going. Heisenberg was a Nobel prize winner and the first enunciator of the uncertainty principle that bears his name. For these reasons, his thoughts on some of the consequences of the principle are well worth reading. However, Heisenberg is also known for other, more dark reasons. He was the director of the German atomic projects in World War II and seemed to have little difficulty in working under the Nazi tyranny while many of his colleagues were hounded and executed. He also proved to be an effective survivor, becoming the head of the Max Planck Institute of Physics in West Germany after the war. This involvement with the Nazis makes the chapter "Encounters and Conversations with Albert Einstein" fascinating reading. From it, you would not know about his record of collaboration with the regime that tried to exterminate Einstein and his ideas. One must read that chapter very carefully and do a great deal of reading between the lines to really understand what is being said. The fact that Einstein was willing to meet with Heisenberg after the war tells a lot more about Einstein that it does about Heisenberg. This book is interesting as much for what is not said as it is for what is said. This was an opportunity for Heisenberg to say something about his involvement in some very bad things as well as to put forward thoughts about physics. The first was missed and the second was a hit. If you are interested in some thoughts about how physics has evolved this century from one of best practitioners, then this is a book that will interest you. This book serves a double purpose. 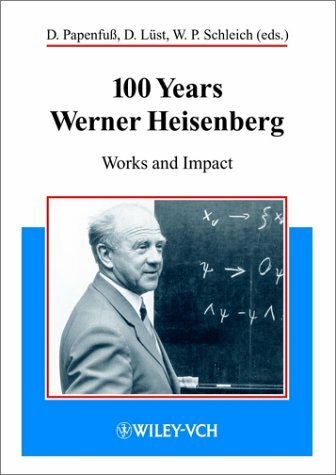 The first part presents two essays commemorating Werner Heisenberg's 100th birthday. They are completed by a short and nicely illustrated biographical note in the appendix. In the second part the reader will find a set of articles devoted to important developments in central areas of research. The authors are outstanding scientists who try to present their ideas to a large community of physicists. This book should be read in conjunction with the book on Ettore Majorana, Brilliant Darkness, if you want a complete picture of what Heisenburg did and why he did it. Majorana and Heisenburg were friends and intellectual equals who both had grave doubts about the coming uses physics would be put to by politicians. Majorana simply disappeared- I believe in his own way Heisenburg was hiding also, hiding in plain sight in his case. I'm convinced Heisenburg did deliberately sabotage the German bomb effort, as Majorana with even more foresight did in his own way for Fascist Italy. For both men physics was a pursuit for the mind and not to be corrupted. This book is well-written and researched so you can check the references and make up your own mind. But Heisenburg after WW II faced an impossible situation. If he had sabotaged the bomb effort on purpose then he bore responsibility in the eyes of fellow Germans for the death & destruction he could have helped prevent. The allies saw such claims as excuses and many Germans would have seen them as treason. Better to just keep silent, as he did. But this is far from a historical issue only. Scientists all over the planet are being paid by and working for war criminals of various sorts, all convinced they are doing good of course, and the moral dilemmas faced in WW II are ongoing. A very readable and thrilling book. Thomas Powers made a good and subtle research. My congratulations! I read this in hardcover soon after it was published in 1993. It was a promising subject (did Nazi Germany get close to making an atomic bomb?). After laboring through a dry 434-page text that seemed to have more to do with espionage, I finished the volume, put it back in my shelves, was greatful to have survived the experience. Yes, Germany hadn't produced a bomb, and there was a lot of contemporary interest on their progress. I only recently finished Richard Rhodes `Making of the Atomic Bomb' (published 1986) and urge interested parties to read it first. Rhodes lucidly documents the scientific principles and all contemporary development efforts (Germany, Japan, Britain, and the USA) up to and including Hiroshima and Nagasaki, and beyond. Oddly, Rhodes produced an advance quote for Power's back cover ("Important and original, another chapter in the epic story of how humankind achieved the means of its own destruction"). One wonders how much of this was professional courtesy from one Pulitzer winner to another. In any case, if you want to read remarkable book on the whole subject (not just a lengthy chapter saddled with minutia), read Rhodes. This is a solid, well-researched book that presents Heisenberg ina fair light, for once. One of the problems with reader/reviewer bias is that many people are pre-disposed to finding fault with any suggestions that conflict with what they want to hear or believe. Regarding the Farm Hall recordings, some people have latched onto the idea that Heisenberg and others knew of the build up of the Holocaust, but continued to work for the Bomb project. What they are usually referring to is a section in which Heisenberg talked about five Jewish scientists, whom he obviously cared about, who had been arrested and later killed; and even though Heisenberg was talking openly about putting out feelers to see if they could be helped or saved (which alone could have put him at great risk), this somehow translates into guilt in some people's eyes. As for him 'not co-operating with Hitler'... nobody in their right mind could possibly think that was an option. As I believe the book shows, Heisenberg did the next best thing, which was to work half-heartedly on the German Bomb. He basically killed it in 1942. The fact that Heisenberg could come up with the correct basic bomb structure - path and critical mass analysis, in very short order almost certainly means that he could have brainstormed the right methodology years earlier if the German scientists had been 100% committed to producing a bomb for Hitler. If they had been Nazis. To me, this fine book is one more step in the right direction, in underscoring the very fact that not all Germans were Nazis. Hitler may have been a charismatic leader, but he made so many catastrophic errors, such as the insane decision to declare war on the USA in the hope that the Japanese would help him against the Russians - they never lifted a finger - that it is as true to say that Hitler lost the War as to say that the Allies won it. A fair and highly recommended book. My first criticism is that the book has way too much minutia which made it dull.I had to really plough through some of it and my reading was interruped by many naps. The second criticism is of the main thesis:That Werner Heisenberg sabotaged the German bomb effort deliberately.I believe his comment at Farm Hall ("How could the Americans have separated two tons of U235?") was a spontaneous statement made by a man who had, until that moment, believed that he was the leader of the pack, and suddenly realized he was the Captain of the Bavarian Little League.It was a reflection of his confusion, shock and ego deflation, not a calculated deception of his fellow scientists.I just looked at the design specs of his Uranium machine in Haigerloch and it has no control rods.More confusion! 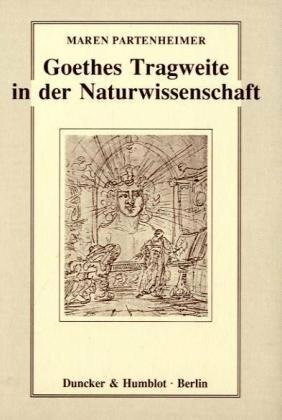 It is difficult to recapture the total gestalt of the German scientist's predicament.Some of the parts of it were fear of failure.Associated with this is a lack of boldness on any of their parts.There was no Groves in Germany (as in Leslie R. Groves). If you work for Franklin Roosevelt and spend 2 billion dollars and fail, you would get fired and spend the rest of your life testifying before Congress.Do that with Hitler and you wouldn't get fired, you would get fired upon!There was a belief on the part of the nazi gov. that the war would be won soon.The held from 1930 until 1942.No sense of urgency!But Heisenberg was not an engineering physicist.He was no Fermi.That is part of it too.To say he sabotaged the German program as part of a heroic effort is simple historical revisionism for the purpose of presenting a new twist.